DIVISIONS.—THE ALGONQUINS.—THE HURONS.—THEIR HOUSES.— FORTIFICATIONS.—HABITS.—ARTS.—WOMEN.—TRADE.—FESTIVITIES.— MEDICINE.—THE TOBACCO NATION.—THE NEUTRALS.—THE ERIES.— THE ANDASTES.—THE IROQUOIS.—SOCIAL AND POLITICAL ORGANIZATION.— IROQUOIS INSTITUTIONS, CUSTOMS, AND CHARACTER.— INDIAN RELIGION AND SUPERSTITIONS.—THE INDIAN MIND. THE JESUITS IN NORTH AMERICA. 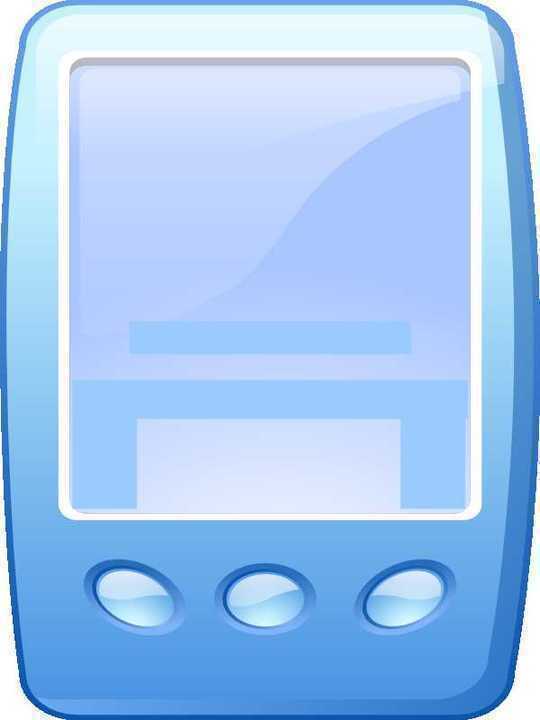 QUEBEC IN 1634.—FATHER LE JEUNE.—THE MISSION-HOUSE.— ITS DOMESTIC ECONOMY.—THE JESUITS AND THEIR DESIGNS. CONVERSION OF LOYOLA.—FOUNDATION OF THE SOCIETY OF JESUS.— PREPARATION OF THE NOVICE.—CHARACTERISTICS OF THE ORDER.— THE CANADIAN JESUITS. LE JEUNE'S VOYAGE.—HIS FIRST PUPILS.—HIS STUDIES.— HIS INDIAN TEACHER.—WINTER AT THE MISSION-HOUSE.— LE JEUNE'S SCHOOL.—REINFORCEMENTS. LE JEUNE JOINS THE INDIANS.—THE FIRST ENCAMPMENT.—THE APOSTATE.— FOREST LIFE IN WINTER.—THE INDIAN HUT.—THE SORCERER.— HIS PERSECUTION OF THE PRIEST.—EVIL COMPANY.—MAGIC.— INCANTATIONS.—CHRISTMAS.—STARVATION.—HOPES OF CONVERSION.— BACKSLIDING.—PERIL AND ESCAPE OF LE JEUNE.—HIS RETURN. PLANS OF CONVERSION.—AIMS AND MOTIVES.—INDIAN DIPLOMACY.— HURONS AT QUEBEC.—COUNCILS.—THE JESUIT CHAPEL.—LE BORGNE.— THE JESUITS THWARTED.—THEIR PERSEVERANCE.—THE JOURNEY TO THE HURONS.— JEAN DE BRÉBEUF.—THE MISSION BEGUN. THE HURON MISSION-HOUSE.—ITS INMATES.—ITS FURNITURE.—ITS GUESTS.— THE JESUIT AS A TEACHER.—AS AN ENGINEER.—BAPTISMS.— HURON VILLAGE LIFE.—FESTIVITIES AND SORCERIES.—THE DREAM FEAST.— THE PRIESTS ACCUSED OF MAGIC.—THE DROUGHT AND THE RED CROSS. HURON GRAVES.—PREPARATION FOR THE CEREMONY.—DISINTERMENT.— THE MOURNING.—THE FUNERAL MARCH.—THE GREAT SEPULCHRE.— FUNERAL GAMES.—ENCAMPMENT OF THE MOURNERS.—GIFTS.—HARANGUES.— FRENZY OF THE CROWD.—THE CLOSING SCENE.—ANOTHER RITE.— THE CAPTIVE IROQUOIS.—THE SACRIFICE. ENTHUSIASM FOR THE MISSION.—SICKNESS OF THE PRIESTS.— THE PEST AMONG THE HURONS.—THE JESUIT ON HIS ROUNDS.— EFFORTS AT CONVERSION.—PRIESTS AND SORCERERS.—THE MAN-DEVIL.— THE MAGICIAN'S PRESCRIPTION.—INDIAN DOCTORS AND PATIENTS.— COVERT BAPTISMS.—SELF-DEVOTION OF THE JESUITS. JEAN DE BRÉBEUF.—CHARLES GARNIER.—JOSEPH MARIE CHAUMONOT.— NOËL CHABANEL.—ISAAC JOGUES.—OTHER JESUITS.—NATURE OF THEIR FAITH.— SUPERNATURALISM.—VISIONS.—MIRACLES. OSSOSSANÉ.—THE NEW CHAPEL.—A TRIUMPH OF THE FAITH.— THE NETHER POWERS.—SIGNS OF A TEMPEST.—SLANDERS.— RAGE AGAINST THE JESUITS.—THEIR BOLDNESS AND PERSISTENCY.— NOCTURNAL COUNCIL.—DANGER OF THE PRIESTS.—BRÉBEUF'S LETTER.— NARROW ESCAPES.—WOES AND CONSOLATIONS. DU PERON'S JOURNEY.—DAILY LIFE OF THE JESUITS.— THEIR MISSIONARY EXCURSIONS.—CONVERTS AT OSSOSSANÉ.— MACHINERY OF CONVERSION.—CONDITIONS OF BAPTISM.—BACKSLIDERS.— THE CONVERTS AND THEIR COUNTRYMEN.—THE CANNIBALS AT ST. JOSEPH. 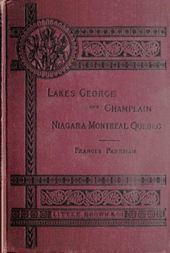 A CHANGE OF PLAN.—SAINTE MARIE.—MISSION OF THE TOBACCO NATION.— WINTER JOURNEYING.—RECEPTION OF THE MISSIONARIES.— SUPERSTITIOUS TERRORS.—PERIL OF GARNIER AND JOGUES.— MISSION OF THE NEUTRALS.—HURON INTRIGUES.—MIRACLES.— FURY OF THE INDIANS.—INTERVENTION OF SAINT MICHAEL.— RETURN TO SAINTE MARIE.—INTREPIDITY OF THE PRIESTS.— THEIR MENTAL EXALTATION. THE NEW GOVERNOR.—EDIFYING EXAMPLES.—LE JEUNE'S CORRESPONDENTS.— RANK AND DEVOTION.—NUNS.—PRIESTLY AUTHORITY.—CONDITION OF QUEBEC.— THE HUNDRED ASSOCIATES.—CHURCH DISCIPLINE.—PLAYS.—FIREWORKS.— PROCESSIONS.—CATECHIZING.—TERRORISM.—PICTURES.—THE CONVERTS.— THE SOCIETY OF JESUS.—THE FORESTERS. THE HURON SEMINARY.—MADAME DE LA PELTRIE.—HER PIOUS SCHEMES.— HER SHAM MARRIAGE.—SHE VISITS THE URSULINES OF TOURS.— MARIE DE SAINT BERNARD.—MARIE DE L'INCARNATION.—HER ENTHUSIASM.— HER MYSTICAL MARRIAGE.—HER DEJECTION.—HER MENTAL CONFLICTS.— HER VISION.—MADE SUPERIOR OF THE URSULINES.—THE HÔTEL-DIEU.— THE VOYAGE TO CANADA.—SILLERY.—LABORS AND SUFFERINGS OF THE NUNS.— CHARACTER OF MARIE DE L'INCARNATION.—OF MADAME DE LA PELTRIE. DAUVERSIÈRE AND THE VOICE FROM HEAVEN.—ABBÉ OLIER.—THEIR SCHEMES.— THE SOCIETY OF NOTRE-DAME DE MONTREAL.—MAISONNEUVE.—DEVOUT LADIES.— MADEMOISELLE MANCE.—MARGUERITE BOURGEOIS.—THE MONTREALISTS AT QUEBEC.— JEALOUSY.—QUARRELS.—ROMANCE AND DEVOTION.—EMBARKATION.— FOUNDATION OF MONTREAL. THE IROQUOIS WAR.—JOGUES.—HIS CAPTURE.—HIS JOURNEY TO THE MOHAWKS.— LAKE GEORGE.—THE MOHAWK TOWNS.—THE MISSIONARY TORTURED.— DEATH OF GOUPIL.—MISERY OF JOGUES.—THE MOHAWK "BABYLON. "— FORT ORANGE.—ESCAPE OF JOGUES.—MANHATTAN.—THE VOYAGE TO FRANCE.— JOGUES AMONG HIS BRETHREN.—HE RETURNS TO CANADA. WAR.—DISTRESS AND TERROR.—RICHELIEU.—BATTLE.—RUIN OF INDIAN TRIBES.— MUTUAL DESTRUCTION.—IROQUOIS AND ALGONQUIN.—ATROCITIES.— FRIGHTFUL POSITION OF THE FRENCH.—JOSEPH BRESSANI.—HIS CAPTURE.— HIS TREATMENT.—HIS ESCAPE.—ANNE DE NOUË.—HIS NOCTURNAL JOURNEY.— HIS DEATH. INFANCY OF MONTREAL.—THE FLOOD.—VOW OF MAISONNEUVE.—PILGRIMAGE.— D'AILLEBOUST.—THE HÔTEL-DIEU.—PIETY.—PROPAGANDISM.—WAR.— HURONS AND IROQUOIS.—DOGS.—SALLY OF THE FRENCH.—BATTLE.— EXPLOIT OF MAISONNEUVE. IROQUOIS PRISONERS.—PISKARET.—HIS EXPLOITS.—MORE PRISONERS.— IROQUOIS EMBASSY.—THE ORATOR.—THE GREAT COUNCIL.— SPEECHES OF KIOTSATON.—MUSTER OF SAVAGES.—PEACE CONFIRMED. UNCERTAINTIES.—THE MISSION OF JOGUES.—HE REACHES THE MOHAWKS.— HIS RECEPTION.—HIS RETURN.—HIS SECOND MISSION.—WARNINGS OF DANGER.— RAGE OF THE MOHAWKS.—MURDER OF JOGUES. MOHAWK INROADS.—THE HUNTERS OF MEN.—THE CAPTIVE CONVERTS.— THE ESCAPE OF MARIE.—HER STORY.—THE ALGONQUIN PRISONER'S REVENGE.— HER FLIGHT.—TERROR OF THE COLONISTS.—JESUIT INTREPIDITY. 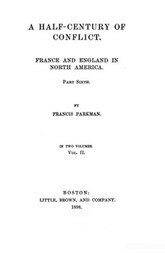 MISCOU.—TADOUSSAC.—JOURNEYS OF DE QUEN.—DRUILLETES.— HIS WINTER WITH THE MONTAGNAIS.—INFLUENCE OF THE MISSIONS.— THE ABENAQUIS.—DRUILLETES ON THE KENNEBEC.—HIS EMBASSY TO BOSTON.— GIBBONS.—DUDLEY.—BRADFORD.—ELIOT.—ENDICOTT.— FRENCH AND PURITAN COLONIZATION.—FAILURE OF DRUILLETES'S EMBASSY.— NEW REGULATIONS.—NEW-YEAR'S DAY AT QUEBEC. INDIAN INFATUATION.—IROQUOIS AND HURON.—HURON TRIUMPHS.— THE CAPTIVE IROQUOIS.—HIS FEROCITY AND FORTITUDE.—PARTISAN EXPLOITS.— DIPLOMACY.—THE ANDASTES.—THE HURON EMBASSY.—NEW NEGOTIATIONS.— THE IROQUOIS AMBASSADOR.—HIS SUICIDE.—IROQUOIS HONOR. HOPES OF THE MISSION.—CHRISTIAN AND HEATHEN.—BODY AND SOUL.— POSITION OF PROSELYTES.—THE HURON GIRL'S VISIT TO HEAVEN.—A CRISIS.— HURON JUSTICE.—MURDER AND ATONEMENT.—HOPES AND FEARS. THE CENTRE OF THE MISSIONS.—FORT.—CONVENT.—HOSPITAL.—CARAVANSARY.— CHURCH.—THE INMATES OF SAINTE MARIE.—DOMESTIC ECONOMY.—MISSIONS.— A MEETING OF JESUITS.—THE DEAD MISSIONARY. HURON TRADERS.—BATTLE AT THREE RIVERS.—ST. JOSEPH.— ONSET OF THE IROQUOIS.—DEATH OF DANIEL.—THE TOWN DESTROYED. ST. LOUIS ON FIRE.—INVASION.—ST. IGNACE CAPTURED.— BRÉBEUF AND LALEMANT.—BATTLE AT ST. LOUIS.—SAINTE MARIE THREATENED.— RENEWED FIGHTING.—DESPERATE CONFLICT.—A NIGHT OF SUSPENSE.— PANIC AMONG THE VICTORS.—BURNING OF ST. IGNACE.— RETREAT OF THE IROQUOIS. THE RUINS OF ST. IGNACE.—THE RELICS FOUND.—BRÉBEUF AT THE STAKE.— HIS UNCONQUERABLE FORTITUDE.—LALEMANT.—RENEGADE HURONS.— IROQUOIS ATROCITIES.—DEATH OF BRÉBEUF.—HIS CHARACTER.— DEATH OF LALEMANT. DISPERSION OF THE HURONS.—SAINTE MARIE ABANDONED.—ISLE ST. JOSEPH.— REMOVAL OF THE MISSION.—THE NEW FORT.—MISERY OF THE HURONS.—FAMINE.— EPIDEMIC.—EMPLOYMENTS OF THE JESUITS. THE TOBACCO MISSIONS.—ST. JEAN ATTACKED.—DEATH OF GARNIER.— THE JOURNEY OF CHABANEL.—HIS DEATH.—GARREAU AND GRELON. FAMINE AND THE TOMAHAWK.—A NEW ASYLUM.— VOYAGE OF THE REFUGEES TO QUEBEC.—MEETING WITH BRESSANI.— DESPERATE COURAGE OF THE IROQUOIS.—INROADS AND BATTLES.— DEATH OF BUTEUX. FATE OF THE VANQUISHED.— THE REFUGEES OF ST. JEAN BAPTISTE AND ST. MICHEL.— THE TOBACCO NATION AND ITS WANDERINGS.—THE MODERN WYANDOTS.— THE BITER BIT.—THE HURONS AT QUEBEC.—NOTRE-DAME DE LORETTE. IROQUOIS AMBITION.—ITS VICTIMS.—THE FATE OF THE NEUTRALS.— THE FATE OF THE ERIES.—THE WAR WITH THE ANDASTES.— SUPREMACY OF THE IROQUOIS. FAILURE OF THE JESUITS.—WHAT THEIR SUCCESS WOULD HAVE INVOLVED.— FUTURE OF THE MISSION.